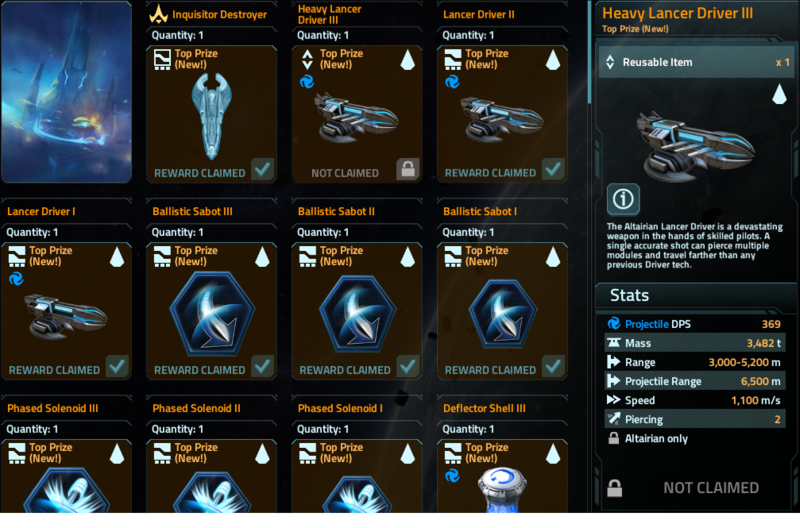 I choose a few preliminary items from the prize list and then the listing for Heavy Lance Drive 3 changes to "Not claimed". Which is true, I didn't claim any, yet. But now I can not claim any. Here is what I fully expect . . . nothing will be done in time for me to use my 1.5 million remaining loot. I will either have to choose junk I don't want or let the loot expire, which wasn't cheap. If that is the case, I want those coins back from my last run. Further, I see no reason to be participating any more since the one remaining thing I wanted is busted. Lastly, why is "Not claimed" even an option for the system? it is pointless. They can assist I’ll forward on to the team but the event is concluding later today. Yes I posted it in the discussion area for the event.. and also submitted a ticket.. Will this be resolved before the end of the event/ prize claim time for the event? Filed a ticket hours ago. Expect little to come of it before it all evaporates and we get nothing. Don’t bother filing a ticket, it will do little to no good, and you will not get the coins you wasted back. The best thing you can do is to stop playing. The only way to not have to deal with the constant bugs is to find another game. I have a suggestion. I know you already filed a ticket. When you file the ticket, be humble. Explain the bug, and how many points you have. You and/or kixeye can probably calculate how many heavy lance drivers that would be. Most likely, they will understand that you had issue cashing out and will give you however many resuables you could have cashed out for. Kixeye is actually very accommodating depending on the situation. You always catch more bees with honey. I have had good results with tickets..... Be calm and state the prob!em....complaints and anger don't help. Just to finish the story, I did not hear for Kixeye in time to continue with the event knowing I would get what I want from the prizes. But after the event I was able to get the items I wanted with the remaining loot I had. Overall I am satisfied and Support did a good job. They get an amazing number of tickets and so it is not surprising that it takes some time to hear from them. I have had issues in the past where misclicks on mobile resulted in expensive coin loss that they would not reverse for me, offereing a one time only excuse/answer that i, to this day, find unacceptable. As such I always go into support discussions with low expectations. I had a similar issue recently where the intel in question expired due to the event finishing prior to the issue being resolved. It took some time and some discussions with support but it was indeed eventually resolved as well. I was pleased with the result, even if it did require some back and forth and clarifications. I've had some misclick and have filed a ticket. they gave me what I had originally wanted and also let me keep my misclick. Not bad, but on other issues its not always a pleasant experience. Awesome to hear guys, support over a weekend can be also hard given the time off so I'm happy to hear they were able to support and also @Got No Coin was able to claim the prizes after the event. I will be followup with the team on this issue though you had during the event, that shouldn't be a thing players experience. Thanks for the info!